Stirred through risotto, griddled onto bruschetta or served simply with parmesan and extra virgin olive oil, asparagus is popular all around the world – not just in Italy. Flavoured simply with fresh herbs and mascarpone for extra creaminess, the asparagus takes centre stage in this decadent Italian classic. In a pan of salted boiling water, cook the asparagus for 2 minutes until just tender. Drain and leave to cool. Once cooled, keep the tips of the asparagus intact and chop the stalks into small rounds. In a large frying pan, heat the Filippo Berio Mild & Light Olive Oil. Fry the onion, celery and garlic on low heat until soft and translucent. Add the rice, turn up the heat and stir well to coat the rice in the oil. When coated, add the wine and let it bubble for a few minutes to cook out the alcohol. Turn down the heat to medium, and begin to add the stock one ladle at a time, stirring continuously. Once fully absorbed, add more stock. 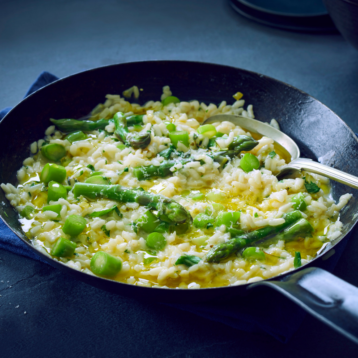 Once the rice is cooked, stir in the asparagus tips, stalks and season to taste; then turn down the heat and stir in the parmesan, mascarpone and herbs. Check for seasoning, serve with a squeeze of lemon and a good drizzle of Filippo Berio Extra Virgin Olive Oil.